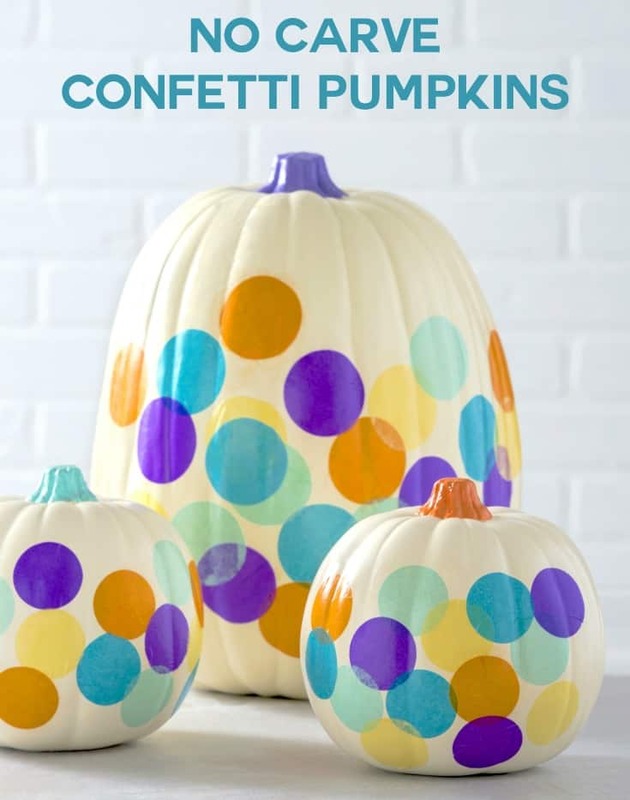 If you are looking for simple no carve pumpkin ideas, try this confetti option with Mod Podge. So easy even a kid could do it! Skills Required: None. 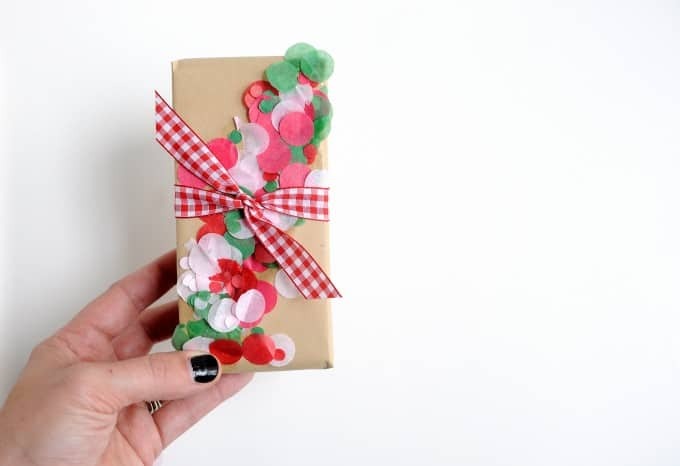 You don't need to have any crafting experience to try this! 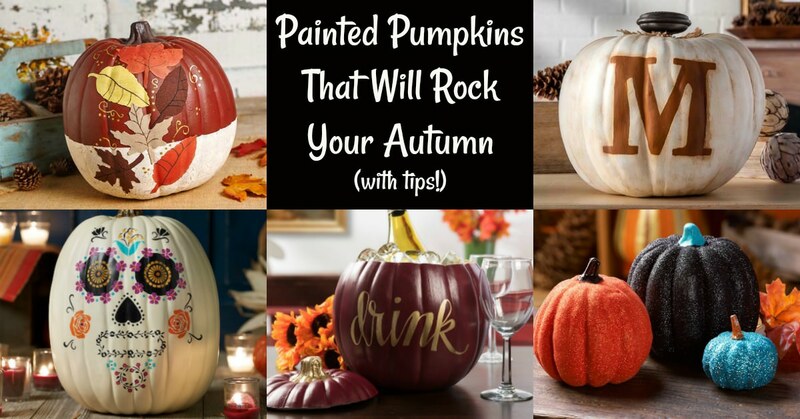 You can do it with either real or faux pumpkins. Scroll down to the bottom of the post to get a video of the pumpkin decorating in action. You're going to love it! I'll never forget carving pumpkins when I was little. We had a furniture dolly that my dad used to take the trash cans out each week, and one day he brought home the largest pumpkin I've ever seen on that furniture dolly – for us to carve! My brothers and I were excited until he opened it up. The smell and the squishy insides were enough to make us run squealing! I'm much more into no carve pumpkin ideas these days. No mess, no skill set . . . no knives. Though you can carve them with knives if you like. 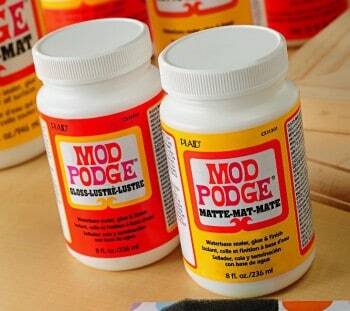 But my preference is decorating them with Mod Podge! 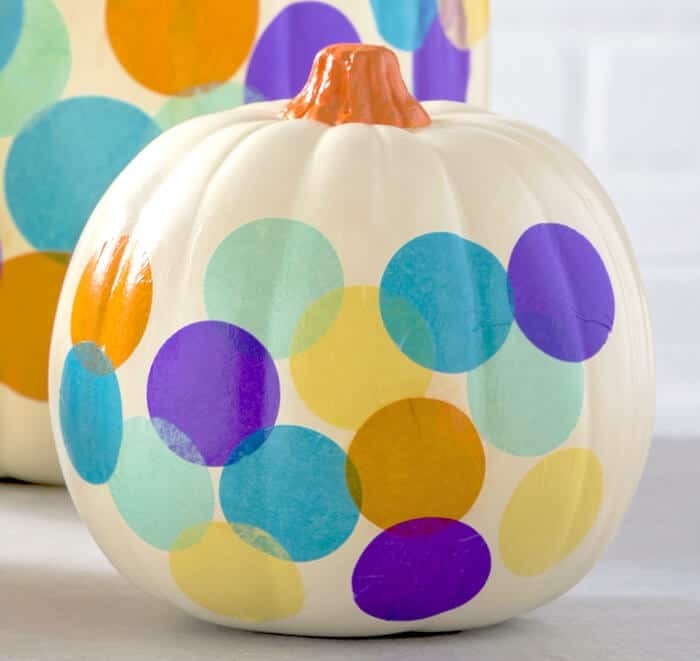 It's so easy to embellish pumpkins with decoupage . . . even a kid can do it. And this project fits into that category. 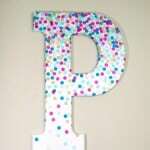 The only choice you need to make is your favorite paint and tissue paper colors. Learn more below. 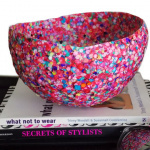 Step One: Select your paint and tissue paper colors. Paint the stems of your pumpkins with several coats and let dry. Step Two: Punch a variety of circles out of your tissue paper. I used a 1 ½ inch punch. 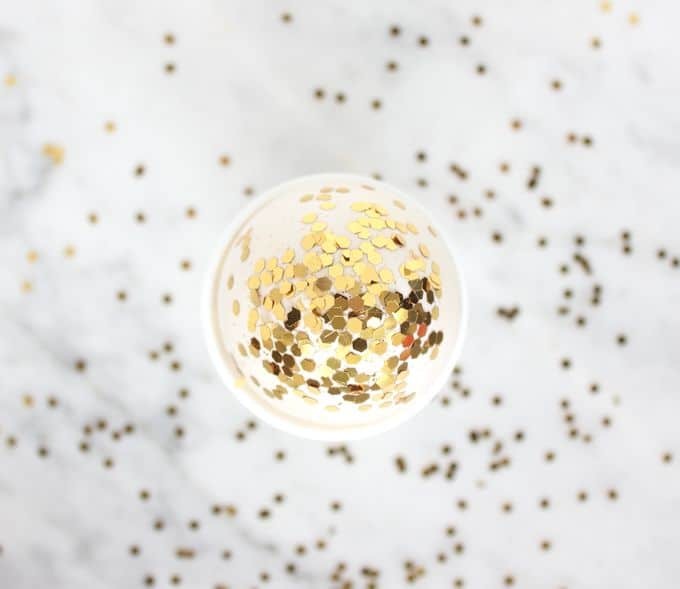 If you don’t have a punch, print a circle template online and use it to trace and cut. 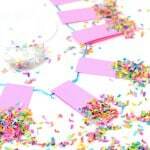 Tip for punching tissue paper: it’s not going to work with one sheet. You need about six sheets or more for the smoothest cut. And gently pull the tissue out of the punch end as it’s easy to tear! Step Three: Apply your tissue paper confetti circles to the pumpkin in a random fashion as shown. Place a bit of decoupage medium on the pumpkin, place the circle on top, and lightly brush it down. You don’t want to brush too much on your first layer because you can start rubbing some of the ink out of the paper; so be gentle! 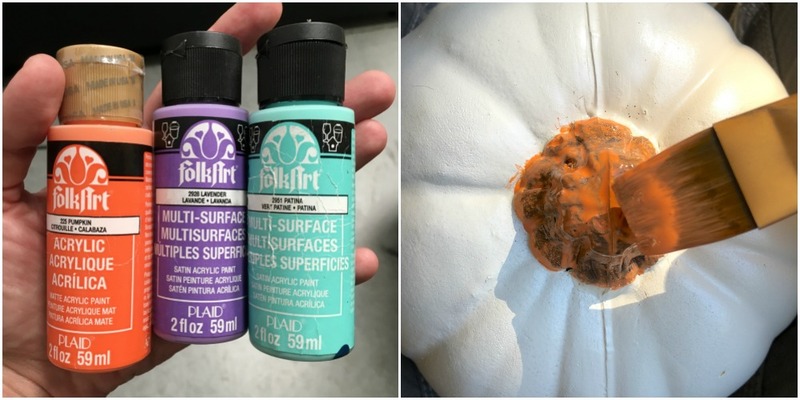 Let dry and then give your pumpkins a final coat of Mod Podge. Display!